Guardians of the Galaxy Vol. 2 (film) After the Guardians—Peter Quill, Gamora, Drax, Rocket, and Baby Groot—help Ayesha, who heads the Sovereign race, protect some valuable batteries, Rocket steals some, and the Sovereign drones attack their ship. The Guardians are saved by a man who identifies himself as Ego, Quill’s father, a Celestial. Ayesha hires Ravager Yondu and his crew to find and capture the Guardians. But old foes become new allies and characters from the classic comics come to our heroes’ aid as Quill tries to learn the truth about his parentage. Released May 5, 2017 in the U.S. after earlier releases internationally beginning with Italy on April 25. Directed by James Gunn. 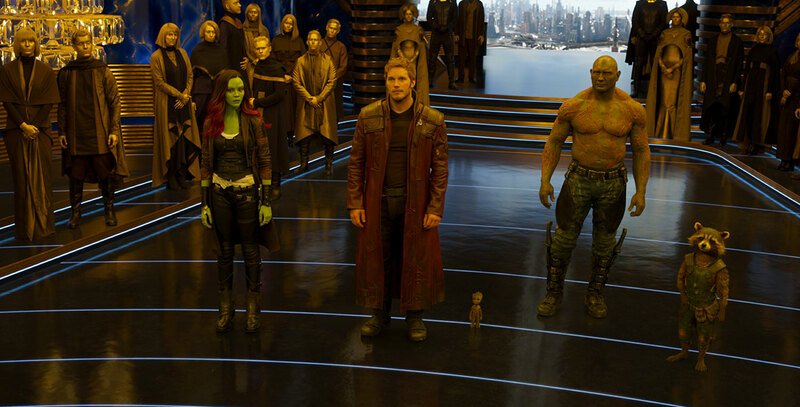 Cast includes Chris Pratt (Peter Quill/Star-Lord), Karen Gillan (Nebula), Kurt Russell (Ego), Michael Rooker (Yondu), Zoe Saldana (Gamora), Dave Bautista (Drax), Pom Klementieff (Mantis), Sylvester Stallone (Stakar Ogord) and Elizabeth Debicki (Ayesha), and the voices of Bradley Cooper (Rocket) and Vin Diesel (Baby Groot). As with the first film, classic songs play a major role, with an “Awesome Mix Volume 2” tape given to Peter Quill by his mother. Filmed in widescreen format. From Marvel Studios. Running time: 136 min.